Since it came to government, Doug Ford’s Progressive Conservative Party has been in a mad rush to ram through as much legislation as possible. Ford claims a mandate from the 2018 Ontario election where the Tories won 76 of 124 seats, but received only 40.5% of the votes cast. Their new laws are an attack on the poor and working class people of Ontario. Nothing exemplifies that better than the proposed omnibus Bill 66. The many Schedules of Bill 66 are replete with attacks on workers’ rights. Schedule 1 removes the right of ornamental horticultural workers to form a union by adding that industry to the Agricultural Employees Protection Act. Schedule 9 states that collective agreements pertaining to construction workers will no longer be binding on public institutions, like school boards or hospitals. The bill removes protections against excessive hours of work and unpaid overtime. It makes it harder for workers to learn about their rights on the job. Bill 66 attacks public oversight. In Schedule 8 all references to public consultation within the Ministry of Health and Long-Term Care Act have been removed, save for one, which leaves the power to call public hearings with regard to Long-term Care facilities solely in the hands of an appointed bureaucrat. In Schedule 4 all references to sub-meters, a device used to monitor the power usage of individual units in an apartment complex, have been removed. Potentially, that removes apartment units from the purview of the Energy Board. As egregious as are the above provisions, the Conservatives outdo themselves by attacking public safety. Schedule 2 of the Bill repeals the entirety of the Pawnbrokers’ Act removing the need for pawnbrokers to be licensed and removing legal guidelines when potentially dealing with stolen goods. Schedule 5 repeals the Toxic Reduction Act and Schedule 7 eliminates Ontario’s requirement for labeling upholstered and stuffed articles which will leave Ontarians ignorant of potentially harmful materials contained in the pillows, sofas and stuffed toys that consumers buy for their children. These are only a handful of the harmful provisions contained in Bill 66. The Conservative government and Bill 66 should be opposed at every instance. But a big problem is the antiquated first-past-the-post electoral system that enables a party to gain the majority of the seats without receiving the majority of the votes. When we take to the streets to stop the Ford agenda, we should also demand proportional representation so that no government can exercise absolute legislative control against the will of the majority of the people. * Kurt Young is a member of the Sheetmetal Workers’ Union and Socialist Action. Over 800 labour activists from across the province responded to the call of the Ontario Federation of Labour (OFL) on March 25 to attend a “Take Back Ontario Conference” at the Metro Convention Center, just a few blocks from the Toronto Stock Exchange. The event was billed as a discussion to initiate a coordinated fightback against the Conservative Doug Ford government. But it was not a decision-making body — more like a public forum. Since Ford’s election last June labour and activist groups like Socialist Action have been calling for an emergency OFL convention where elected delegates could set policies and make plans for a general strike. With the “Progressive” Conservatives holding a majority of seats in the Legislature, many on the left emphasized that we cannot afford to wait until the next election to challenge this government directly. It is imperative that labour make the province ungovernable and thwart the hard-neoliberal austerity agenda, before irreparable damage is done. SA members Julius Arscott and Barry Weisleder spoke early from floor mics to argue for escalating actions towards a general strike to oust the Tories. Many folks applauded. To deflect this sentiment, former UNIFOR staffer and current OFL President Chris Buckley asked “Can we mobilize 100,000 people tomorrow in Ontario to fight the Ford government?” But isn’t this the wrong question? What we need to know is: How do we prepare to mobilize 100,000 people? Sending activists back to their communities, to have tea with their neighbours, is not going to reverse the Ford agenda. An effective response from labour is needed. It is time to draw a line in the sand, to unequivocally state that the movement will defend every union local and every public service from further privatization and theft. That means when Ford tells teachers “don’t even think about strike action”, the response should be “See you on the picket line!” It means when a PC politician’s office is messed up, don’t make sappy apologies; double down and denounce the violence inherent in taking over $3 billion in wages away from Ontario workers when the planned $1/hour increase in the minimum wage was cancelled just before Christmas. It also means putting resources into community groups to engage in direct actions, not telling rank and file activists to go build the movement, while the labour brass thinks about getting on board. The labour leadership has been putting the rank and file to sleep for the past 30 years. Now witness the full consequences of that. What are some highlights of the conference? Injured workers issues were discussed, the idea of an OFL rapid response network was promoted, and one speaker, migrants’ rights activist Preethy Sivakumar laid out some stunning truths that are not often aired in official union gatherings. She spoke about the connections between racism and inequality, how right wing political leaders use racism to divide the working class and maintain economic equality, and how union members are not immune to these types of narratives. She maintained the number one job of unions is to “eliminate competition between workers and lift the floor for everyone.” Massive support was pledged for a health care rally on April 30 at Queens Park. Attacks on the construction unions were analyzed. Again, for effective actions to come from these discussions we need uncompromising leadership. Organizers of the April 30 rally should look to shut down Queen’s Park and fan out from the lawn, stop traffic, push aside the barriers, and take over the front steps. Who knows, workers might decide to address the legislature. Union leaders representing members in the construction trades who tacitly supported Ford during the June 2018 election need to be replaced. The OFL conference was followed by an evening “Stewards Assembly” convened by the Toronto and York Region Labour Council, with attendees seated by electoral district. While it was interesting to connect with local area activists, the assembly severely limited cross-city input (there were no mics on the floor). By the end of the evening the mood of disappointment was palpable. Chris Buckley gave another tiresome speech, dolling out a few contradictory and self-serving phrases. After the event organizers released a statement that accurately reported the “massive turnout for yesterday’s Stewards Assembly spoke volumes about the appetite to get organized and build solidarity.” But the nearly one thousand rank and file activists in the room received little more than platitudes. Exceptional was a speech by author Linda McQuaig and some short videos featuring rank and file activists who are battling austerity within their workplaces. Nonetheless, the small opening offered by the labour bureaucracy should be seized. Resolutions passed in community and labour groups that call for mass action are needed. Support striking workers. Defy back to work legislation. Confront and shut down alt-right and white supremacist groups where they appear. Occupy spaces that are under threat from the Thug Ford government. The slogan of ‘educate, agitate, organize’ must take on a more radical meaning, and come to life, to spark mass resistance and force an entrenched labour bureaucracy to join us on the street as we confront the major assault on the working class in Ontario that is taking shape at breakneck speed. Below is a resolution that unions, NDP electoral district associations, social justice movements and all working class organizations can discuss and adopt. Why now? If working class organizations go on record now in favour of mass action opposition to the Ford/Conservative agenda in Ontario, and for a democratic united front of resistance to capitalist austerity, it will help to prepare and coordinate the next phase of struggle. Do you agree that this can be a useful tool in our tool kit — to connect with rank and file workers, fighters against oppression of every kind, and social justice movements? Be it resolved that (…fill in your union, NDP association and/or community organization) request that the Ontario Federation of Labour hold an emergency convention to adopt an action plan to confront and defeat the Doug Ford – Progressive Conservative government agenda. Be it further resolved that (your union, etc.) commits to respond with mass protests, including rallies, demonstrations and job actions, up to and including sectoral and general strikes, against Doug Ford – PC government attacks on public services, civil liberties, equity seeking groups, unions and non-organized workers in this province. We believe that all unions and social justice partners, in anticipation of serious cuts to jobs and services, should go on immediate strike alert and build a broad, democratic united front of resistance. Right wing governments in Canada seem to be on the ropes. Prime Minister Stephen Harper’s regime is mired in scandals, the latest centred on a $90,000 payoff by his former chief of staff to cover-up misappropriation of funds by Conservative Senator Mike Duffy. Three Tory Senators accused of padding their expense claims now sit outside the Tory caucus as ‘independents’ while the RCMP investigates. 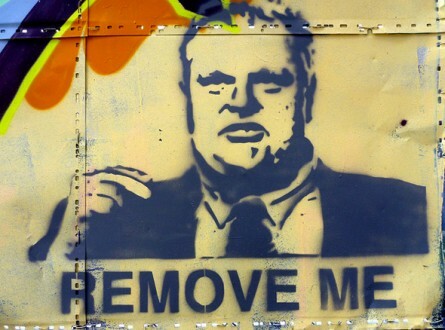 Toronto’s ‘stop the gravy train’ Mayor Rob Ford claims he doesn’t use crack cocaine. But two Toronto Star reporters, and the owner of U.S. web site Gawker, swear they saw hizzonner in a video sucking the smokey contents of a crack pipe. Five staffers quit the Mayor’s office in the two weeks after the news broke. Ford insists there is no such video, but according to inside sources, he confided to his staff that he knew the location of the hidden video. And one of the people pictured partying with Ford was found by police dead of gun shot wounds. Montreal’s mayor, Gérald Tremblay, resigned in early November in the midst of an eyebrow-raising inquiry that revealed widespread corruption among city officials, contractors and members of organized crime. Just a few days later, Gilles Vaillancourt, the head of Quebec’s third-largest city, Laval, quit in the same context. The Ontario minority Liberal government was rocked by revelations that it spent nearly $1 Billion to cancel the construction of unpopular gas plants west of Toronto, just to save Liberal seats in the Fall 2011 provincial election. After months of denial, and failure by former Premier Dalton McGuinty to release thousands of pages of incriminating evidence, new Premier Kathryn Wynne apologized for the wasteful fiasco. Media pundits call it a right wing meltdown. It’s entertaining. It sells papers. In the case of Toronto, there was even a side benefit — it helped to kill a harmful downtown mega-casino project. But, looking at the big picture, scandal is no cure for austerity. Severe cutbacks and attacks on employment insurance, pensions, public services, environmental protection, scientific information-gathering and civil liberties continue apace. The fact is, such measures are integral to the corporate agenda in force, regardless the political stripe of the ruling party. The situation in Toronto further illustrates the deeper problem. Liberals and social democrats, the main city council opposition to Ford’s wilting ultra-right wing, are chomping at the bit. They yearn to introduce new gas and sales taxes. They promote service fees, parking levies and road tolls to fund rapid transit projects urgently needed to relieve traffic gridlock. Instead of proposing to tax big business, giant banks, wealthy developers, rich property owners and untaxed religious institutions, Ford’s opposition and the business media agitate for regressive taxes (the kind not based on ability to pay), which hit workers, seniors, students and the poor the hardest. All of which goes to show what the real problem is. It’s the system. It matters little which eccentric leader, or authoritarian big wig, or capitalist party happens to be at the top. Scandals are just a sign of divisions in the ruling class. They can be interesting, even mildly satisfying when they (however temporarily) humble the arrogant. But scandal mongering is no substitute for mass action. Working class political action is what’s needed now to stop labour concessions, to reverse social cuts, to restore and extend democratic rights – in short, to win a Workers’ Agenda.